Am I missing something here.....? Hi - ice newbie here. Not much of a catcher, it seems. Been out three times so far in the last month - all during mid-day, on small lakes near Buffalo with summer sunfish populations. I've tried depths of 5' to 35' in weeds and over silt in various heights in the column. Presentations have included deadsticking crappie minnows on #6 octopus hook below a split-shot, crappie minnow on wee teardrop or 1/4 oz. ball jig. Waxworms on above, also. I'm usually too busy tending to my son to sit-n-jig, or frequently re-tie a variety of presentations. We've also set tip-ups with 4"-8" suckers on QSR's to no avail. One small northern was caught deadsticking a small jigging spoon with a big fat-head in 10' of water over a 15' weedy slope. I have a used 7" mora hand auger, no electronics, no shelter. I guestimate my depth with a clip-on and by counting reeling revolutions. I guess bottom content by jigging around a bit - if I snag weeds...It's weedy. My arms are good for about 16 holes in 6" ice, 12 holes in 8" ice and 10 holes in 10" ice. I've put in 15 hours over 38 holes on 3 seperate bodies of water for 1 fish. Anybody got any pointers for me? I would invest in a power auger. I dont fish more than 10 mins in one hole and just keep on going. If you know you are on a lake that produces quality fish you will find them. Many times by noon I will already have augered 38 holes. If you have a kid to young to fish, gills on ice are one of the worst fish to go after. They bite like a trout and need a hook set right now or else they're gone. Your attention will be on the little one and need a fish that will take line like an eye, pike or crappie. You may be in the right spot but at the wrong time. Your fishing mid day and you'll have to find a lake with a good day bite. Stay away from clear lakes, find a stained lake. What is that lakes weak spot at that time of year and for what species? If you don't know pick another lake or dedicate your time to finding it. Start targeting one species of fish and fine tune yourself to that species. Don't try a blanket effect or rely on luck. could be a # of things. scent on hands, line size, hook/jig size & color, time of day, stained or clear water, snow cover/no snow cover, type of bottom (weeds,mud, gravel), water/air temp, or just not biting. see if you can roundup a locator, will greatly up your odds. Hey...you need to simplify...you're suffering from information overload and expectation...you're just way too technical for a guy with a hand auger! I've had about the same success as you thus far this year. Dad got a vexilar and power auger for christmas that i've been giving plenty of use let me tell ya having a vexilar is awesome! Finally started catching some fish, but like it was said in earlier posts, it take a lot of moving around sometimes! For golfers, we say take two weeks off, then quit. Find a small shallow lake with one or two deeper holes Im talking 5-8 ft average with 15 ft holes or somehting. Fish those. Gills and crappies will not relate to the shallow, they will crowd into the deeper water. Here's my advice, go fishing with Fishface5 or give Cyberfish a call, he loves taking novices and families fishing and you can't beat his guide fee. 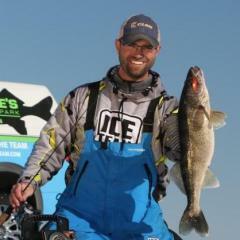 I would say all of us who ice fish and don't have mastery of a lake struggle often, even good ice fisherman. I think a big key in successful ice fishing is finding something that works well on a specific lake than riding the bite hard. It takes experience to know just where to go on a specific lake and be consistently successful. Finding and spending time on the water with people in the know and then listening to what they have to say is the best shortcut there is. Also Beg borrow or steal a sonar set up for ice fishing. Unless you are sight fishing or setting tip ups all the time, there is no more important ice fishing equipment. I'm confused. 1132 posts, FM Pro staff- ice newbie? Fishface5 - I will be e-mailing you shortly. Thanks. Lunker - great advice; thank you. Fish in a barrel - so to speak. BP - I've had some right and true offers of ice-mentorship from some very good folks and appreciate all of them. My schedule, unfortunately, doesn't allow too many opportunities these days to get out. My budget can't give up any $$ for additional equipment this year, so a sonar is out. ST - Rolling On The Floor Laughing My A55 ...sore? I like the stained lake idea. Drowned Minnow - Thanks for teh reminder regarding time out - he agrees, but I'd like for him to get at least one fish this winter. MJ5-Thanks for the encouragement and the jig-size advice. I sized up to 1/4 to hang the curl out of the mono...maybe that wasn't such a good idea. You must have Lakemaster, eh? I'll e-mail you soon with my 'have beens' & 'wannas'...thanks! FrozenMinnow - Good question and deserving of an honest answer. I've never ice fished until last year (once-no fish) and again this year, at my son's insistence (3 times-one fish). If you have any pointers you can kick down to me I'd be most appreciative . I know a thing or two about the Upper Missy I'd be happy to share for softwater season. 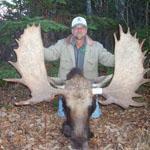 The lakes I've tried are Berthiaume (North & South) and Deer. I thought for sure Deer would yield something. I even lumped a wad of waxies ON the bottom of Deer on the centerfield 25' flat thinking a bullhead or carp would take 'em. Where do you live? I would be happy to fish with you. I live near Grand Rapids.